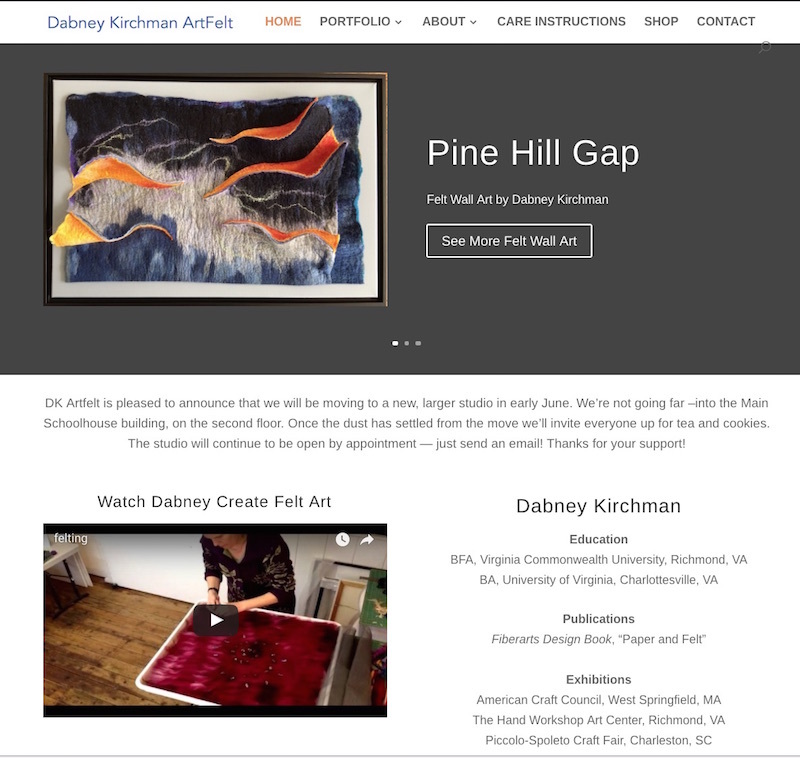 Sperryville, Virginia felt artist Dabney Kirchman is attracting more customers and selling more of her art since Herbst Marketing launched her new website in March, 2017. Just sold my first piece because someone had seen it on the website. Not only that, she came in and bought another piece that was not on the website. Yipppeee!!! DabneyKirchmanArtfelt.com showcases Dabney’s beautiful felt artwork, including wall art, hats and flat squares made of felt. The new website also features an eye-catching time-lapse video showing Dabney creating a work of art in felt, as well as care instructions for felt art and portfolio pages of her framed pieces, hats and felt flat squares. Her work also can be found at Cottage Curator and Blue Ridge Artisans. She is a member of the Artisan Center of Virginia Rappahannock County Artisan Trail network and was included in the November 2016 Artists of Rappahannock Studio and Gallery Tour. You can follow Dabney on Facebook at Facebook.com/DabneyKirchmanArtfelt and on Instagram at Instagram.com/dk_artfelt. Are you looking to update your website? We can help!